Graflex.org :: View topic - What type of back is this? What type of back is this? 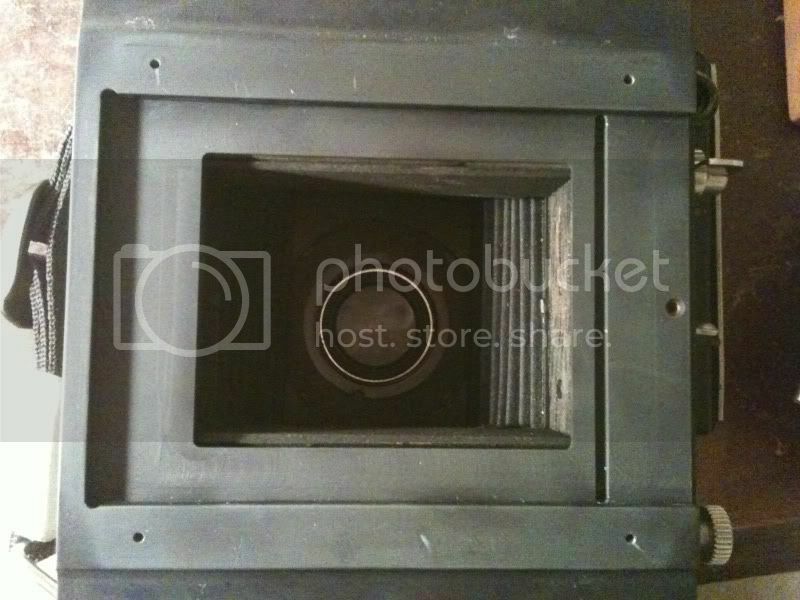 Posted: Sat Apr 21, 2012 8:53 pm Post subject: What type of back is this? I have just become the proud owner of a circa 1946 Miniature Speed Graphic. It came with what I have identified as a "graphic" Singer RH10 6x7 back. It looks as though the back has been permanently mounted to the back of the camera (see attached photo), but it looks like a professional job. It almost looks like a "Graflok" mount minus the sliding bars. Any ideas? 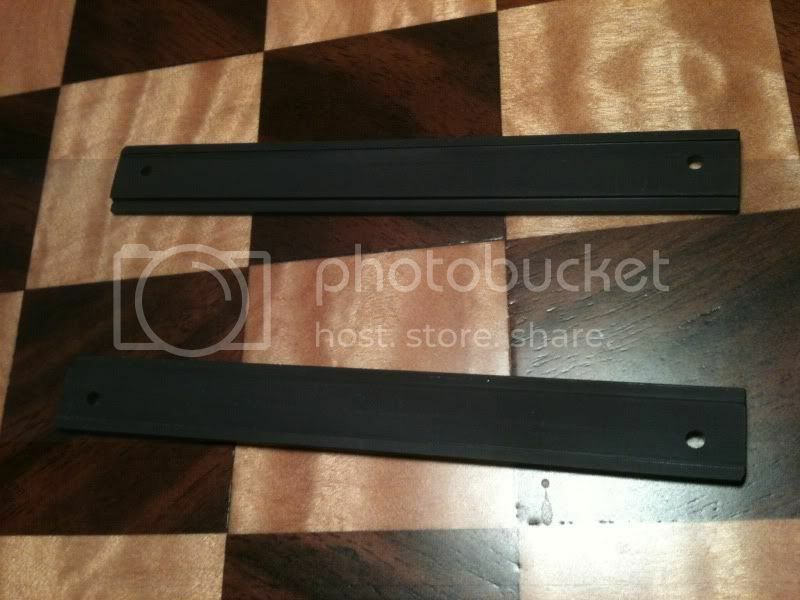 I would really like to be able to switch to a 6x9 back without having to disassemble this mount every time. It's actually a Roll Film Holder attached to the camera back. The Miniature Speed Graphic came with a Graphic back as standard equipment. Graflex and a later retro fit Graflok back were available. (the one pictured in the link has a Graflok back). Remove the 4 screws holding the mount bars onto the camera back and lift the bars off. If there are screw holes at the center of the film opening then this is a Graphic back and there will be a grove in the back at the right edge of the film opening. If it is a modified Graflok then there will only be the 4 screw holes and the same grove on the right. A Graflex back will have a wider film opening and a ridge on the right. A RH8 or a Graphic 23 knob wind will give you 6x9 cm on 120 film. If so, am I just missing the sliding bars that hold the back in place? Where would one find these (apart from purchasing the entire Graflok assembly, or another body, that is)? 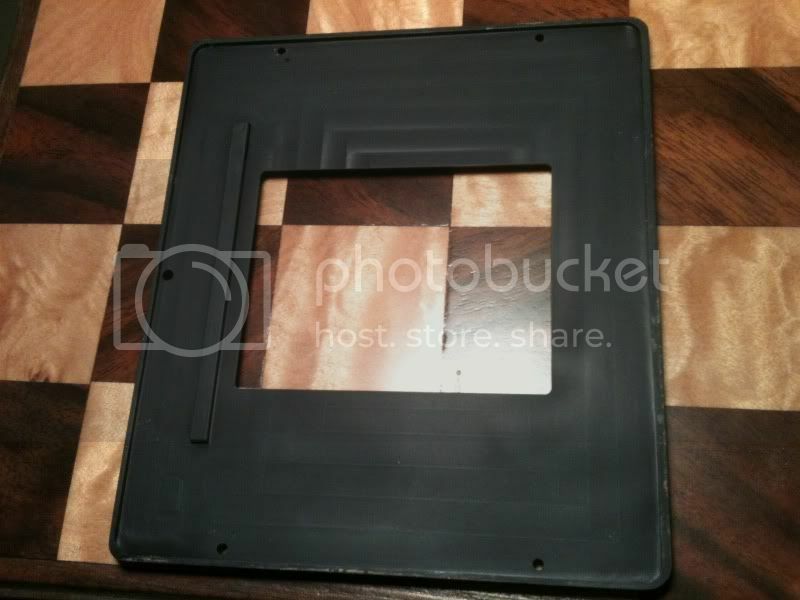 I'm familiar with 4x5 graflok backs which have a ground glass panel called focus panel that clips onto two pins and operates like a spring back. I do not see any pins or provision for them. The focus panel for a 2x3 graflok may be different. Perhaps another member will confirm, but I think this is a graflok without the sliding lock bars and focus panel. Hurray!!!!!!!!!!!!!!! the hot keys did not dump me to another web page and loose all that I typed. I have a couple of 2x3 Pacemaker Graphics with factory Grafloks, had a Mini Speed with a retrofitted 2x3 Pacemaker Graflok. I don't have a larger Graphic but have seen a few. Charles, my 2x3s' Graflok backs are smaller versions of the larger ones I've seen. I also have a couple of dividing Grafloks from Sirchie fingerprint cameras. I don't think they were made by Graflex. All have sliding bars to retain attachments such as rollholders. One of the Sirchies has no pins to hold a Graflex-made focusing panel. It is like the international back on my 2x3 Cambo, whose focusing panel is retained by Graflok sliders. I think -- could be mistaken -- that joe4 has a Mini with a nicely made homebrew rollholder adapter. It doesn't seem to be a factory back. If the RF isn't calibrated for the rollholder and lens that are on the camera, the camera is completely useless. Not because it won't operate but because there's no provision for focusing. joe4, your best bet is to bail out and get a 2x3 Speed with a complete factory back, spring or Graflok. Adapt-A-Roll 620 roll holders can be used to shoot 2x3 with just about any 2x3 camera that has a spring back. Graphic and replace the one that's on your camera. I see this as second best because complete Grafloks sold without a camera usually cost more than a complete camera. Loose spring backs cost less, but a Graflok is preferable. I like my little AAR 620s but many people despise them. 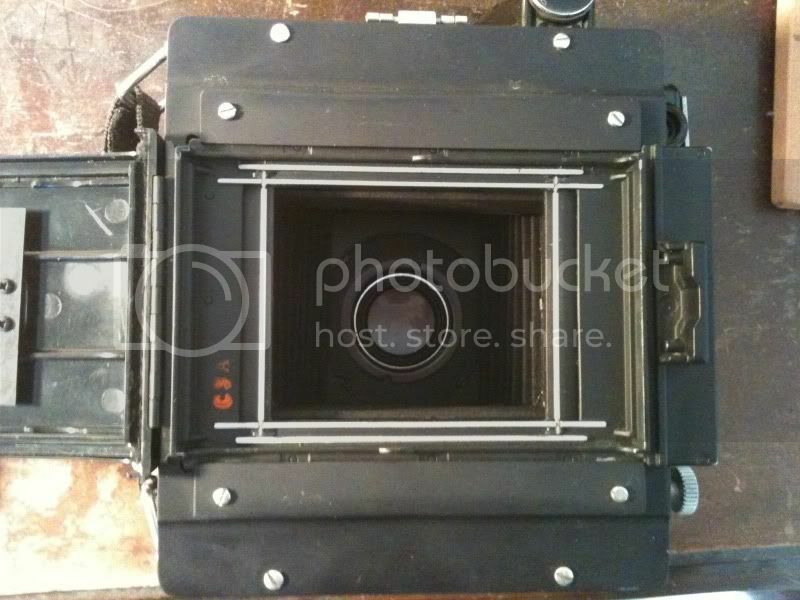 If you're lucky you'll be able to find a scrap camera with a complete back, preferably Graflok. Thanks for your responses. If this is a homebrewed back, the guy that made it was a master machinist- the rollfilm holder fits perfectly in the recessed area, and the two black bars that hold the holder in place are machined with a ridge on one side and a bevel on the other (this puts pressure on the roll holder as you tighten down the 4 screws). As for the RF, it seems to be callibrated correctly (infinity is correct, and I measured out to 4' and this is sharp as well). This is definitely a home brewed back for Graphic accessories. The retrofit Graflok back for Minis kept the flash sync. Had it been for Graflex accessories there would have been a ridge on the back and a groove on the roll film holder. I suspect your back will say Graphic on it somewhere. Referring to your first photo with the RFH open. There are two polished bars top and bottom. With the camera on a tripod place a piece of ground glass, ground side toward lens, on the two innermost bars. Focus the lens on infinity, 25 feet, 8 feet and check the rangefinder at each focused distance. Use a loupe or magnifying glass if possible. An alternative to the ground glass is to use Scotch Magic transparent tape across the film opening without overlapping attaching to the two innermost bars. I was able to check the focus by taping wax paper over the rollers, and it seems to be spot on. The rangefinder seems to even focus down past the 4' markings, down to roughly 2' (don't know how I would accurately frame this close, but it's nice to know the rangefinder will work). As for elongating the holes, that is a possibility if I can't come up with a set of graflok bars. I might also see if I can get some small thumb screws with the right thread to replace the screws holding the bars in place, and just loosen the bars to replace the backs. The general consensus seems to be that this is a non-factory graflok back. Could it be some sort of military version? I ask because the original owners name is stamped on the inside of the instruction manual and he was a Lt. Co. in the USAFR. If this is just a home made back, I have to imagine that either a) the original owner was a machinist or b) he paid a pretty penny to have it made in a machine shop. In either case, the build quality seems to be as good or better than the factory ones I have seen, just not as user friendly. USAFR= United States Air Force Reserve. A military camera will have a military serial number plate attached or the evidence of one having been there. The Graflex serial number is on the bottom side of the camera top. What is the Graflex serial number? The countersunk screw hole along the right edge at center of the film gate entrance suggest that this is from another make of camera. Remove the back and see if there are any marking on the inside of the back. Hmm, no plates that I can see. The serial number on the inside of the front of the body is 377310. 377310- #924 of order #3827 for 3500 2 1/4 x 3 1/4 Speed Graphics listed 1/9/1946. A second order of 2000 for the same camera was listed on the same day. No notation of anything special. The back frame locks to be a factory made piece but whose factory. Is it possible this is off a 2x3 view camera anyone? The lock bars are probably custom for a roll film holder. My feeling is that this is a home-made adapter by an amateur photographer who is (or was) an engineer or machinist by profession. As best one can tell from a photo it is the sort of thing that such a person would be able to make with a good milling machine and lots of time and patience. As a mechanical engineer I have made several such photographic accessories and they tend to look that way.